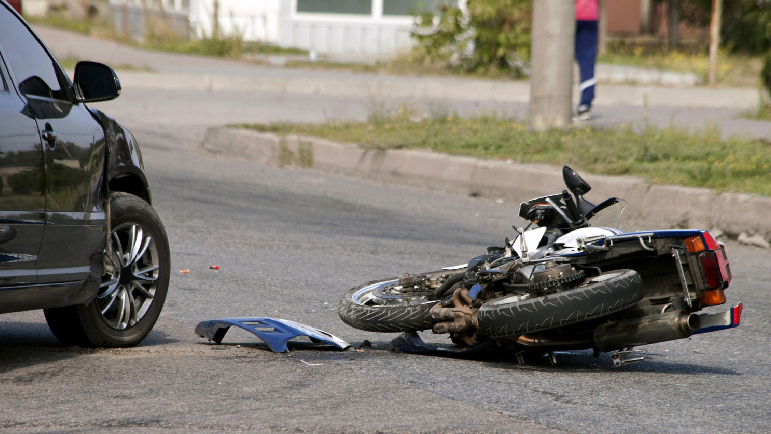 As many knows, motorcycle accidents are more common and often riskier than general vehicle accidents. In fact, fatalities from accidents are a whopping 28 times more common for motorcyclists. Part of the latter has to do with other vehicles not seeing motorcycles on the road at times and not being able to stop or slow down in time, causing a more major impact. Another major reason fatalities are greater for motorcyclists versus those driving a car or truck is because they aren’t enclosed within their vehicle, and there is less vehicle surface area for another vehicle to hit. Checking for injuries at the scene of the accident is critical, both on yourself and on others involved. Even with motorcycle equipment, there’s a chance you’ll have some sort of scrap, cut or other wounds. Check for blood and pain. Apply pressure on bleeding areas. Refrain from moving your or another’s head and neck if there is a pain; let the paramedics decide what to do. If your head was struck after a motorcycle accident, do not remove your helmet; only lift your visor if applicable. Completely removing your helmet may worsen a potential head or spinal injury. Additionally, make sure to replace your helmet if you were wearing one as it may no longer be effective. Even if you’re no longer at the scene of the accident, continue to observe your injuries for signs of healing or lack thereof. Taking several pictures of the scene and of everyone involved’s license plates and vehicle damage is a great idea. Take photos near and far to ensure you capture the most detail as possible. Also, collect personal information from witnesses and those directly involved in the accident. Once you have evidence collected, make sure to have it organized for police and/or an attorney. Photos, videos, contact information of witnesses, and the like are all important. The more evidence and information you have, the better. Even if the police are not called to the scene, keep what you collected from the incident! You never know if you’ll later need it. When an accident occurs, it’s critical to notify the police, particularly at the scene itself. However, if for whatever reason, you are unable to call the police right away (e.g., no cellphone, no reception, someone’s in a hurry), you can usually report an accident a day or few later with no problem. While collisions can be complex as no two accidents are alike, notifying the police is sometimes even more critical for motorcyclists where it’s common that the other vehicle(s) involved didn’t see the motorcyclist, making it harder to negotiate who was at fault. Additionally, with the varied traffic laws for motorcyclists and general motorists, it’s important to have authority involved. Again, many motorcycle accidents are complex cases as different vehicles are often involved, and there are some laws that only apply to motorcyclists. A motorcyclist may argue that they made a safe lane change while a motorist driving a car might argue that they didn’t see the motorcycle coming at all. For that reason, it might be critical to see legal help after the collision. If you want to learn more about reaching out to an attorney after a motorcycle accident, please visit https://www.daveabels.com/motorcycle-accidents.html for more information. Being a motorcyclist, or a motorist at all for that matter comes with risks. Just like with traditional vehicle accidents, it’s critical to know what to do after a collision. Checking for injuries, collecting evidence and gathering information, notifying the police, and potentially seeking out legal help are all things that are important to do after an accident, especially for motorcyclists.